Leon West End Waiter and Singer Aaron Rahn talks about his unique job role! To make it within the arts, you have to have the passion and the determination to succeed. The industry is incredibly competitive, and what can often be glossed over are the countless amount of auditions attended to gain that lucky break. Performer Aaron Rahn is currently embarking on this journey, and is also adding a touch of the West End at Leon-a restaurant embracing the arts and bringing a slice of theatre to the dining experience. 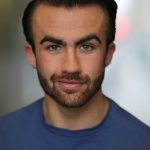 Aaron talks about his time at Leon, his inspirations as a performer and offers very useful advice. 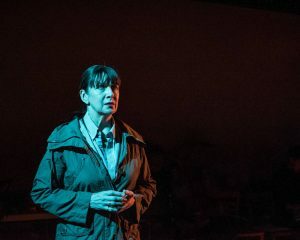 “Currently on international tour, Cheek By Jowl’s tale is a modern telling replete with creative solutions to a tricky Problem Play, balancing truth and a sense of play. Courtesy of Cheek by Jowl. 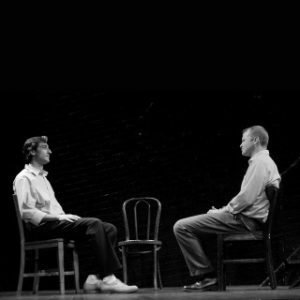 Hailing from Chicago, veteran improv performers, TJ and Dave, take their eponymous show to Soho Theatre. After a few perfunctory words of introduction, the pair launch into a long-form improvised set, running just under an hour. Simon Stephens and Imogen Knight have teamed up once more to mix dance with theatre. Call me simple but a production titled Nuclear War does invoke expectations that there will be some global crisis in its make-up. This is not the case with Stephens’ latest piece. 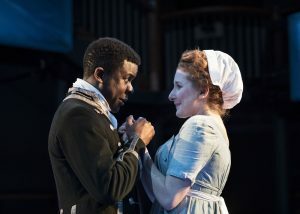 Artist Director Paul Miller directeds this run of The Lottery of love and it definitely seems a lucky dip of highs and lows. 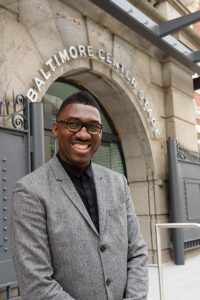 Artistic Director of Baltimore Centre Stage Theater, Kwame Kwei-Armah tells us more about the venue! 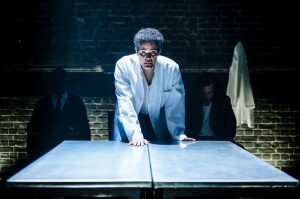 Evening Standard Award winner Kwame Kwei-Armah blazed the trail in 2003, with his fifth work, Elmina’s Kitchen becoming only the second play written by a black playwright to be staged at the world renowned National Theatre. 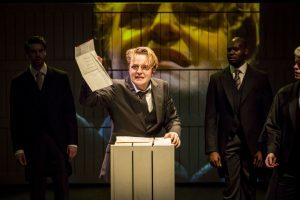 The play would also become Olivier Award nominated, and would also televised, further highlighting the playwright’s ambition and talent. Fast forward to 2017, and Kwame has helped to steer the Baltimore Centre Stage Theater into a collaborative, digitally aware and dramaturgically driven direction, taking on curatorial responsibilities as the theatre’s Artistic Director. Find out more about how the celebrated performer and playwright decided to take on this exciting role in the U.S. When Albert Camus wrote his novel The Plague in 1946, it was considered a metaphor for the rise of fascism. 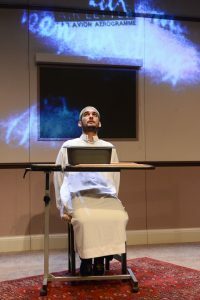 Although director Neil Bartlett usually shies away from adapting novels because it is so very difficult, he felt that this particular work remains highly relevant today. Bartlett keeps all of Albert Camus’ – translated – words and only cuts and reworks the novel according to his concept. Chinglish is brought to us by David Henry Hwang. Not only is he a Tony award winner and Pulitzer finalist but he has had a successful sell out show at both The National theatre and The Park. To say his credentials set the bar high would be an understatement. 4 years ago this year, Theatrefullstop was established. It started off as a lone venture however the blog turned site has brought together a collective of like minded theatre lovers who champion the UK’s rich theatre culture. We want to thank all the theatres, theatre companies, press, performers, theatre festivals and of course you loyal readers for supporting us along the way! 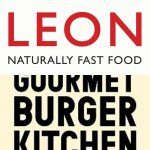 As a token of your support and to celebrate 4 years, we’ve compiled 4 theatre prizes which will all include Leon vouchers for 2, a Gourmet Burger Kitchen voucher and a pair of tickets to a show! Can the concept of ‘us’ and ‘them’ ever become a thing of history? Sadly, probably not. Who or what creates this notion of ‘the other’? Is it an event? A series of events? The ruling power at that point in time? An influential publication or speaker? Or a combination of these factors? What’s paramount in the West is that daily life has been directly effected by the devastating events of 11th September 2001, we now live in a world where we are constantly on alert and are told that we live in threat of one of our biggest enemies. The media have created a narrative of who to fear, and dangerously building up stereotypes about certain cultures and faiths.